My daily walk takes me past several houses under construction. 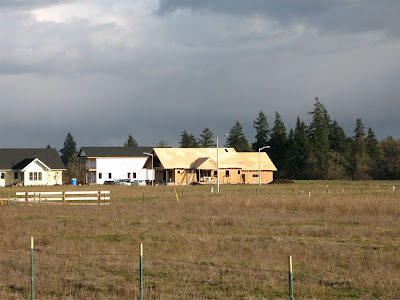 It always surprises me to see new houses going up while so many stand vacant and empty nearby. Still, there they are, and there are the workmen hammering away at roofing and siding and sheetrock while Mexican music blares across the field, along with occasional bursts of energetic sing-a-longs. Mexican music always sounds cheerful to me, though this no doubt reveals deep cultural ignorance. Still, it’s very pleasant on a partly sunny morning to hear people working and—seemingly—enjoying it. As a counterpoint, not far from this busy scene I passed two workmen leaning on a dirty pickup truck in front of a half-finished house. “Oh Jesus,” moaned the second. I take this to mean that either the ex-wife is a harridan or the economic slow-down is reaching a low point locally. Or, maybe both. The gentleman had a nice bass speaking voice though. Maybe he could go over and join the Mexicans in song.